Trips and falls that take place outside your home - this will be covered by your liability coverage, and your insurance will pay for your defense coverage too. If you need more coverage, consider buying an umbrella policy, which will go above your home and auto! Smaller injuries - this will be covered by medical payment coverage, which is a no fault coverage and could provide protection for a smaller injury. Need a reminder on what is included in your policy? We can help! Stolen / damaged decorations - this would be covered under your personal property limit, subject to the applicable deductible but you may want to determine if it's really worth pursing a claim. Check around your property for low tree limbs, support wires, or garden hoses that may prove hazardous to young children rushing from house to house. Pets get frightened on Halloween. 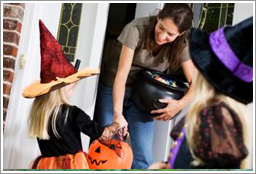 Keep pets in a safe area to protect them from cars or inadvertently biting a trick-or-treater. Glow sticks, light sticks, or battery-powered lights for jack-o-lanterns are preferable to real flame candles. For more information on how R&R can help you with your home insurance protection, visit our website.